You don't have to solve the problem alone! At Philadelphia Basement Systems, we have a team of expert in-house foundation contractors that are here to help you identify and solve your issues with warrantied products and services. We provide free, no-obligation foundation repair quotes throughout our Pennsylvania, New Jersey, and Delaware service area. Call or e-mail us today to setup your foundation inspection! At Philadelphia Basement Systems, we have effective, warrantied solutions for foundation problems of all types, and we have the training, techniques, and top-quality products you need to permanently solve your problem. To help you decide if our solutions are right for you, we complete a thorough inspection of the foundation and provide free written foundation repair quotes throughout our Pennsylvania, New Jersey, and Delaware service area. 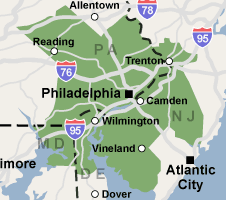 We are a locally owned and operated company proudly serving Newark, Philadelphia, Reading, Trenton, Camden, Wilmington, Cherry Hill, Bensalem, Vineland, Chester, and the surrounding areas. To schedule an appointment, contact us by phone or e-mail today!